Venues Portfolio – 100% Live, Wedding Soul Band. We perform at many established venues. Here is a small selection from our portfolio. Please follow the links for more information. Set within 650 acres of beautiful Welsh countryside, The Vale Resort is the perfect destination for a prestigious wedding. We have had the pleasure of performing for corporate and wedding clients, and at charitable fundraising events held in many of the suites at this elite Welsh venue. 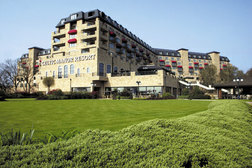 The Celtic Manor Resort, Newport. ﻿Host of the 2010 Ryder Cup golfing competition, this award-winning resort is set in 2000 acres of parkland. It comprises a 5-star hotel and a historic 19th-century manor house. We are proud to have entertained clients in the hotel and golf clubhouse at wedding receptions, parties, and corporate events. ﻿St David's Hotel & Spa, Cardiff. 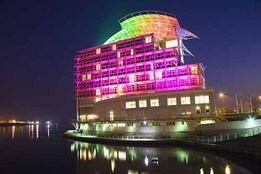 Located on the stunning waterfront of Cardiff Bay, the St David's Hotel & Spa is a luxury 5-star hotel and event venue Voted in the top 10 hotels in the UK in the Conde Nast Traveller Readers’ Choice Awards 2015. We always feel privileged when performing at this unique wedding venue. The plush Canada Lodge, set in its own grounds in a quiet and secluded corner of Creigiau, north-west of Cardiff, started life as a modest fishing location and expanded greatly to become a hugely popular licensed wedding venue. We perform there often and have a number of wedding bookings at the lodge in our diary for this year. Set in the heart of the Brecon Beacons, Craig-y-Nos Castle is the perfect location for your romantic and historic wedding in Wales. 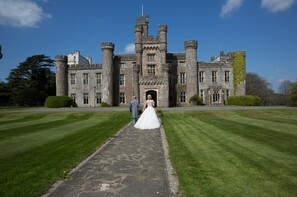 With the wonderful Welsh countryside it really is a special and atmospheric venue. Functions here always create a memorable impression, though we are yet to encounter the ghosts that reputedly haunt it! We are proud to be a recommended supplier. 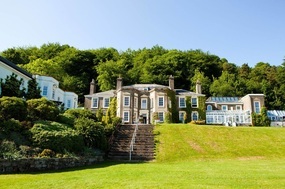 Miskin Manor is a family owned business, situated in 22 acres of glorious welsh countryside. 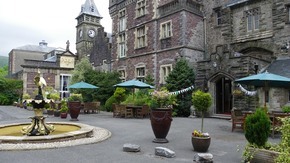 The Manor itself is a grade II listed building with a wealth of Welsh history. With 43 bedrooms all individually furnished, it is a perfect venue for any event. It is very popular with our clients and a favourite of ours. Whether it is a wedding, corporate function or party, we are able to provide the entertainment. The privately-owned 4 star Victorian country house hotel provides a warm welcome for your wedding reception, while the extensive gardens provide excellent photographic opportunities overlooking the picturesque Vale of Glamorgan countryside. This venue is always a great location for live music and wedding entertainment, and we have performed there on many occasions. 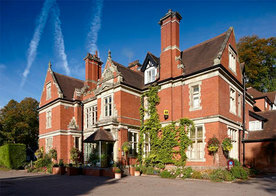 St Pierre Marriott Hotel & Country Club, Chepstow. The hotel, converted from a stately 14th-century Welsh manor and situated on 400 acres of magnificent parkland in the Wye Valley, offers an unparalleled luxury experience and top-notch service. The internationally renowned golf course provides sweeping views of the lush Monmouthshire landscape. The venue offers a variety of rooms to suit your requirements, all of which easily accommodate an 8-piece band - Your guests will be dancing to our sweet soul music all night long! 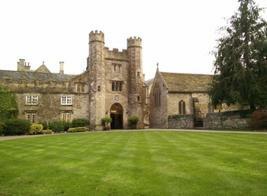 ﻿De Courceys Manor, Pentyrch, Cardiff. If you’re looking for a chic venue for your wedding, family celebration, or corporate event, De Courceys Manor delivers in style. ​A magnificent setting that offers guests, panache, service and personality - the ideal choice for any occasion. We have entertained many clients there and the acoustics in the dining room are excellent, Our eight band members fit perfectly in front of the large bay window. 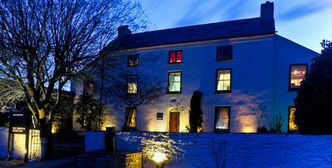 Corran Resort & Spa, Laugharne. The Corran Resort & Spa offers an unrivaled location for a wedding. 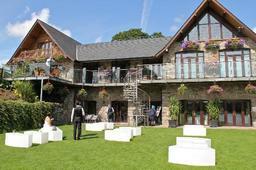 The Corran is truly one of the most romantic and unique wedding settings in Wales. We recently performed there providing wedding entertainment for Mr & Mrs Tommy Bowe (British & Irish Lion and Ireland rugby international). The New House Hotel, Cardiff. With unrivalled views across Cardiff & the beautiful Vale of Glamorgan, this privately-owned 4 Star Hotel provides the perfect venue for an unique wedding. We have entertained many wedding clients in both the marquee and hotel. The wedding party atmosphere is always something special in this luxurious country location. Hensol Castle is a castellated mansion in the gothic architecture style dating from the late 17th century or early 18th century, now a stylish wedding and conference venue for The Vale Resort. We are regularly invited to perform there - not many wedding bands have the stage presence to fill such a venue. 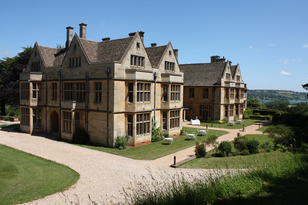 Set in the beautiful North Somerset countryside just a few miles from Bristol and Bath, elegant Coombe Lodge has been sensitively transformed from a family home into a wonderful, contemporary venue, whilst retaining the elegance of its past. It is a truly stunning location, and has featured in many film and television productions. We are one of the venue’s recommended entertainers and perform there often. 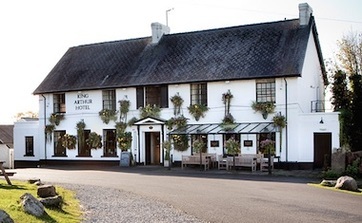 Located in beautiful grounds in the heart of the Gower, The King Arthur Hotel offers the perfect venue to enjoy your special day. The lovely 'Avalon' room boasts an abundance of character and charm, with its high pitched ceiling and oak beams. The secluded courtyard and private landscaped gardens surrounding it provide a wonderful backdrop for your wedding. We always enjoy performing there and are one of the hotel's recommended entertainers. One of the oldest properties in South Wales, Pencoed House Estate is a wonderful wedding venue with a relaxed and welcoming atmosphere. Past residents include Members of Parliament, Ministers of the Church, Sheriffs of the County, and descendants of the Kings of Glamorgan. The Old Hall with its wooden beams and stone work is the perfect location for any wedding party. We love performing there and are delighted to be one of the venue’s trusted partners. Situated close to the Welsh border in the heart of rural Herefordshire, Lemore Manor is a fantastic wedding and event venue. Built in 1640, and sympathetically modernised, the beautiful house and gardens provide a wonderfully tranquil setting. 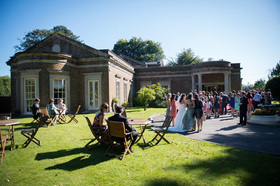 The marble-floored orangery in particular is a perfect location for a wedding reception. We are very pleased to be one of the Manor’s recommended suppliers.